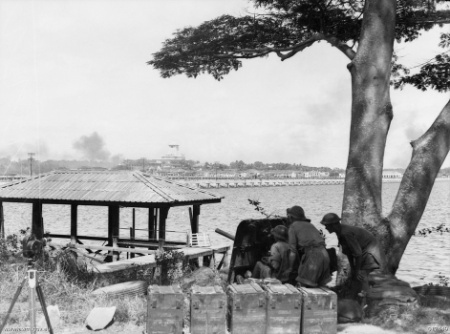 The Battle of Kranji was the second stage of the Japanese plan for the invasion of Singapore during the Second World War. On 9 February 1942 the Japanese Army assaulted the north-western front of the British colony of Singapore. Their primary objective was to secure a second beachhead after their successful assault at Sarimbun Beach on 8 February, in order to breach the Jurong-Kranji defence line as part of their southward thrust towards the heart of Singapore City. 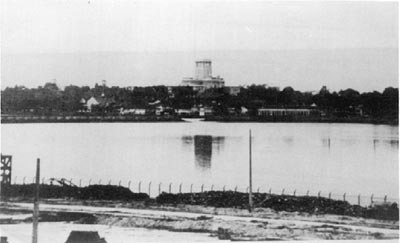 Defending the shoreline between the Kranji River and the Johor-Singapore Causeway was the Australian 27th Brigade, led by Brigadier Duncan Maxwell, and one irregular company. 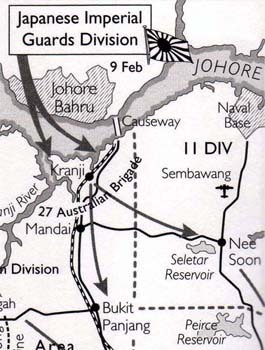 On 10 February the Japanese forces suffered their heaviest losses while moving up the Kranji River, which caused them to panic and nearly aborted the operation. However, a series of miscommunications and withdrawals by Allied forces in the ensuing battles allowed the Japanese to swiftly gain strategic footholds, which eventually led to the fall of Singapore on 15 February 1942. The terrain around Kranji was primarily mangrove swamps and tropical forest intersected by streams and inlets. The shoreline between the Kranji River and the Johor-Singapore Causeway, nearly four kilometers long, was defended by the Australian 27th Brigade, led by Australian Brigadier Duncan Maxwell. The 27th Infantry Brigade consisted of three battalions—the 2/30th, 2/29th, and 2/26th and was supported by the 2/10th Field Artillery Regiment, as well as one platoon from the 2/4th Machine Gun Battalion. They were supported by one company from Dalforce (named after its commander, Lieutenant-Colonel John Dalley of the Malayan Police Special Branch), a local Chinese militia consisting of Communists, Kuomintang supporters, and other volunteers. As the war intensified, the Dalforce volunteers were given only three to four days of training and sent to the war front with elementary weapons. Lacking uniforms, the volunteers improvised by wearing a red triangle on their blue shirts to avoid being mistaken for Japanese by the Australians.